Happy Tuesday friends!! Today is a pretty special day for me since it marks 2 years since I started this little space of mine! I can't thank you all enough for coming here, reading & commenting. The friendships I've made with you have been nothing short of amazing! I'm beyond lucky to have this community and honestly can't think of what I did before blogging! I think I've come a long way since my first post . This blog has afforded me so many new and different experiences and I don't see myself stopping anytime soon! Thank you again for reading and continuing to support B~Loved Boston! If you could please let me know what you'd like to see this next year - I'd love to hear it!! Happy 2 year anniversary, sweet friend. I"m so glad I found your blog two years ago! Love you, friend! Aww how sweet! Happy 2 years! You and your blog are amazing! Your words and gorgeous heart put a smile on my face!!! Thanks for being you and thanks for sharing a little bit of your world with us sweet B!!!! Enjoy this day beautiful!! Happy blogiversary friend!! So glad that you started this space 2 years ago so that we could be friends (and one day....SOON!?!? !...have a blate). Awesome giveaway, girl! Congrats on 2 years!!! What an exciting milestone. I love reading you blog and am excited to see where you continue taking it!! Happy Blogiversary! What an amazing space that you have created! Cheers to many more anniversary's! Two years is so exciting! I'm so glad I found your blog because I really enjoy reading it!! Cheers to many more years of blogging! Happy 2 years friend!! So happy to have met and become friends through blogging :) I’d love your beauty reviews! Happy 2 years! Can't wait to see what the next 2 bring! Hooray for two years of blogging! I love all of your posts and can't wait to see what other great ones you have in store for the future. Happy Blogiversary. So glad I haven't gotten to know you. I always like your Friday posts. You find some of the best hair and makeup products too. Happy blogiversary! Your blog is basically required reading for me because I know I'm always sure to find something fabulous :) So glad to have "met" you through the blogging world! Happy blogiversary beautiful friend! I've loved visiting this space the past 2 years, and even more so that I got to meet you this past summer. You are as beautiful a person inside as you are out, and it truly shines here in this space of yours! happy two years girly! i'm so glad you blog and i love that we've become friends. now we just need to meet already! keep up all the amazing posts love! Yay for your blogiversary! So glad I have this space to visit each day! Congratulations! I'm so glad to have connected with you in the blogging world! You are doing a great job! Happy happy two years!!! So glad that I've been here since almost the very beginning, I love stopping by everyday! Your beauty posts are always some of my favorites :) Cheers to many more fabulous years! Happy Blogiversary!! I think you do such a great mix of posts so I don't really have any that I think you should be doing, lol. My favorite are definitely what you've gotten up to over the weekend and when you take your trips. Your beauty ones are good, too. I've definitely found some good products thanks to you!! Happy Blogversary! I would love to see more day-in-the-life or personal blog posts. I love getting to know bloggers a little better! Happy Blogiversary!! I'm so glad I found you!! Congrats! I love following along! happy 2 years! You don't look a day over 1! Thankful you decided to create your space because I surely do enjoy it! Well Happy Anniversary!! I always enjoy reading your blog and even though sometimes I am short on time I have you on my short list so I don't miss anything. Keep doing what you're doing girly! Love it! Happy anniversary!!! Love your blog and hope to meet you at the upcoming Boston Bloggers dinner! Would love to see you do Q&As on your blog. Mazel tov, doll!! How fast did that go?! So proud of you... today and always!! Love your product reviews and weekend posts! Happy Blogiversary Pretty Lady!! You are one of the sweetest bloggers I know. Your positive outlook is always refreshing. Visiting your blog always brightens my day. Cheers!! Yay! Happy Blogiversary! I hope you have an amazing year to come! Happy 2nd anniversary Biana. So glad you opened a blog and I just read that first post, too. I would love to see more posts about wedding events that you do and at least one outfit post a week, from you. I have seen your style and I definitely think you are very stylish while being girly and classy too. Here is to thousands more posts! Happy Blogiversary! Isn't it fun to look back at where you started?! Congratulations and here's to many more!! Happy Blogiversary!!!! I am so glad that I have gotten the chance to know you through your blog. I love your Friday posts with a variety of your favorite things and for giving me a place to share my weekend shenanigans week after week! Cheers to another fabulous year! Happy happy! I like your favorite things posts, keep 'em coming! Auguri!! I love hearing about Boston adventures and fashion! Happy blogivarsary and congrats on two beautiful years! I've loved getting to know you in this space and over in mine. Cheers to you, this blog, and many more posts and years to come! HAPPY TWO YEAR BLOGIVERSARY!! Isn't it amazing to look back and see how much you have done and accomplished with your blog!? Congratulations!! 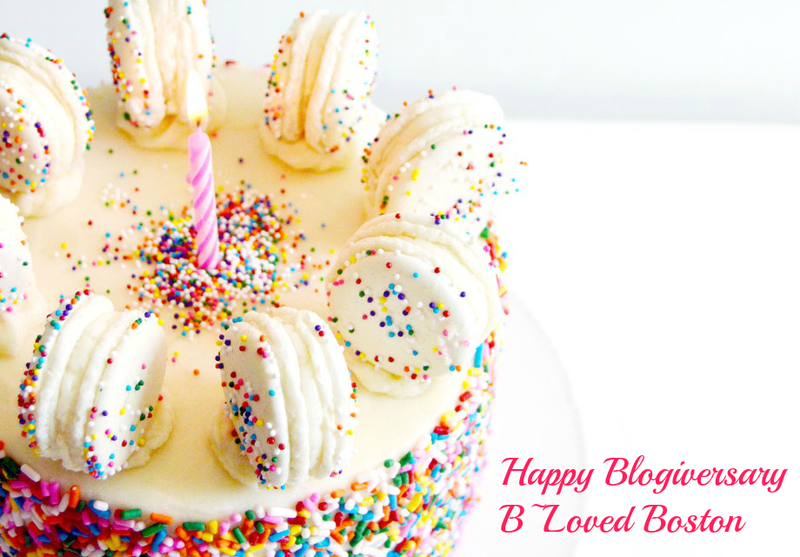 Happy blogiversary Biana :) I've always enjoyed reading your blog! Happy blogiversary!! Thanks so much for sponsoring such a fun giveaway :) This could certainly help with some Christmas shopping! I love reading posts about your favorite things and life in Boston! Congratulations!!! I love seeing your outfit ideas :) Can never have too much inspiration! happy two years! so fun! Happy Blogversary! I would love to see more beauty round-ups and reviews and outfits! Happy Blogiversary! This is so exciting! I really enjoy reading your blog everyday & look forward to future posts! Happy blog birthday! I love reading your posts about local things you do in Boston! Happy blogiversary! Yay for two years! Happy Blogiversary! Congats to you! First congratulations on the two years! That's amazing! I love a lot of what you write as it is now. I would say I would love to see where you get more of your accessories from. Happy blogiversary! It's crazy how fast the time flies between when you decide to start writing on your little piece of the interwebs and when you hit the major milestones like a two year blogiversary! Hoorayy!!! Happy blog anniversary, I love your blog. Ah congrats Biana! Keep on doing what you're doing-- I love your space! Happy two years, sweet girl! Your blog seems to get better all the time, and I always enjoy reading it every day. Happy two year anniversary! I'm coming up on my two month... I know, pretty exciting huh? As a new blogger, it is really fun to check out successful blogs and see where they started and how they've grown. Congrats!! Happy Two Year Anniversary! Keep up the inspiring content- love your little space! Happy two years, lady! Do something fun to celebrate YOU tonight! Congratulations Biana! I love your blog and am happy to connect with you. I would love to hear more about your business, but love all your posts! Love what you are doing!! Happy blogiversary!! I would like to see some day in the life type of posts. I always look forward to outfit posts! Yay for 2 years!!! I love all your posts. Your friday favorites are always good! Congrats on 2 years!way to stick with it. I'm inspired to start my blog back up. I seriously LOVE when you do product reviews! & of course, your weekend happenings! ;) happy blog anniversary. So exciting!! Happy two years! You are definitely an inspiration when it comes to blogging. I love visiting your site on the regular! I think my fave was your empties video. It was super informative! Happy Blogiversary girl!! I love reading your posts daily. I love your product reviews because you give great descriptions on what you like and maybe don't like about a product. Congratulations on 2 years of blogging! It's crazy how fast it flys by! Happy Blogiversary! As someone relatively new to blogging it's so awesome to see! So glad I found your blog! Congratulations on these 2 years! So exciting! Happy 2 years! LOVE your blog so much. Keep up the good work! Congrats on two years, Biana! Love your blog! Congratulations on two years! Such a big accomplishment!! happy blogiversary!! and many mooreeeeee (totally singing this). more posts about your life are always fun! Congratulations! Blogging is a challenging and rewarding experience. Happy blogiversary friend!!!! So happy to have met you through this pretty space of yours on the interwebs! Happy blogiversary!! Congrats on two years! Happy 2 year Blogiversary!!! I'm so glad I found your blog!! Happy Blogiversary hon, and I wish you all the best in the years to come. Congrats and happy blog bday! Also ... can we talk about how delicious that cake looks?? What and exciting milestone, happy 2 years of blogging to you! Thank you for this awesome giveaway! Happy 2 years!!! I love your blog the way it is! Happy blogiversary! I keep forgetting mine, lol. Here's to many more years of blogging. Happy, happy blogiversary!! Time definitely flys when you're having fun! And I totally cringe looking at my early posts - haha!! Happy blogiversary!! I'm so glad you're here!! Congrats! I love your blog.....classy, inspiring, fun.